Methylcobalamin: a natural and bioactive form of vitamin B12. Methylcobalamin works closely together with folic acid and protects blood, nerves and DNA. Methylcobalamin is one of the two bioactive coenzyme forms of vitamin B12 that our body requires – the other is adenosylcobalamin. All other forms of vitamin B12 must first be converted into either methylcobalamin or adenosylcobalamin in the body in order to become active, as only these two forms have a direct working and beneficial effect on health. Particularly concentrated in milk and cheese, methylcobalamin is a natural B12 form present in many foods. In the body, it is most commonly found in the cells and central nervous system. How does Methylcobalamin B12 Work? Methylcobalamin B12 functions directly inside the cells, where it is responsible for the reactivation of folic acid (folate). Without methylcobalamin, folic acid is present in a form that is unusable for the body and can therefore not develop its full effect. The consequences can include anaemia, nerve damage and genetic errors in cell division. This reaction also breaks down the harmful amino acid homocysteine, which damages blood vessels and is associated with cardiovascular problems, vascular diseases and strokes. The resulting methionine is a precursor of S-adenosylmethionine (SAM). SAM is the most important methyl group donor in the human body and provides methyl groups for over 100 methylation reactions. SAM thus plays an important role in detoxification, the regulation of enzymes and genes, the protection of nerves, and the synthesis of neurotransmitters. A shortage of SAM leads to a deficient production of the neurotransmitters acetylcholine, dopamine, serotonin, and adrenalin/epinephrine and to a general disruption of the biochemical balance in the brain. This can result in poor concentration, mood swings and neurological disorders. Furthermore, it can also advance the onset of diverse psychological symptoms and illnesses. Given that methylcobalamin can be used directly by the body and does not need to be converted first, it has a clear advantage over the synthetic form cyanocobalamin, which must be converted into methylcobalamin in three distinct steps. This reaction is partly dependent on other vitamins and coenzymes and uses up the body’s resources; a clear disadvantage. Part of the cyanocobalamin obtains its methyl group from SAM, through which the latter is broken down and can no longer fulfil its aforementioned tasks. 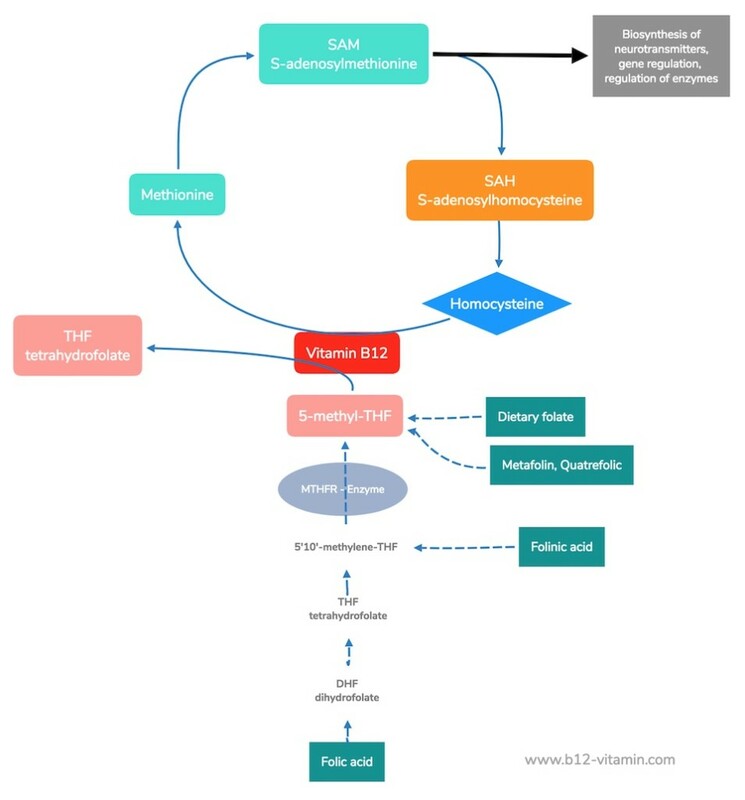 However, vitamin B12 is actually responsible for the formation of SAM. In contrast to methylcobalamin, which delivers an important methyl group, the residual cyano group contained in cyanocobalamin is at best unnecessary and at worst damaging. For those with a heightened exposure to the neurotoxin (e.g. heavy smokers) the resultant cyanide can cause harm, even though the quantity contained in cyanocobalamin is extremely low. More importantly, methylcobalamin is significantly better absorbed into the cells than cyanocobalamin. Although B12 blood values initially rise higher with cyanocobalamin than with methylcobalamin, shortly thereafter a large portion of the cyanocobalamin is excreted unused, whereas methylcobalamin reliably increases the vital cellular B12 level (1). In light of these factors, natural, bioactive methylcobalamin proves to be a much better choice of active ingredient in vitamin B12 supplements than the synthetic cyanocobalamin. Better still is a combination of the natural forms, as we will explore below. Although theoretically all B12 forms can be converted into each other, positive effects have been observed with methylcobalamin that have not been seen with other B12 forms, particularly not with cyanocobalamin (2). Animal experiments have also shown that methylcobalamin greatly increases the life expectancy of mice with cancer; cyanocobalamin did not show this effect (3). Moreover, in rats, methylcobalamin was able to even regenerate severely damaged nerves (4). Since methylcobalamin can also be absorbed via the oral mucosa, it is commonly available in the form of lozenges or drops. Whether this actually has any therapeutic advantages is still to be proven, since the relevant studies have not yet been carried out. It could be argued that lozenges would be the best form here because methylcobalamin may not be chemically stable in the stomach and intestines. This is however contradicted by the aforementioned studies, which have recorded good absorption of methylcobalamin via the intestines. Methylcobalamin B12 drops should also follow the same line of thought – yet here too there is an unfortunate lack of informative studies. Nevertheless, it is worth noting that in both cases a much longer contact between vitamin B12 and the mucous membranes would be necessary. The question thus remains as to whether the likelihood of accidentally swallowing too soon is too high here to make these reliable and effective forms of supplementation. Moreover, lozenges have the disadvantage in many cases of containing a variety of artificial flavouring/colouring additives, undesirable in a vitamin supplement designed for improving health. Particularly problematic are certain sweeteners, such as aspartame, which can have adverse effects. When purchasing such supplements, it is thus important to take a closer look at the ingredients. Those who prefer to avoid additives as much as possible are best advised to take capsules, which for technical reasons can only contain the pure active ingredient. It is still advisable to always check the label on supplements, as some producers opt for using unfavourable additives. Methylcobalamin B12 – The New Gold Standard? For good reason, methylcobalamin is becoming ever more popular and could soon be the standard ingredient in B12 supplements. The plethora of advantages speak for themselves. Having said this, methylcobalamin is only one of the natural, bioactive and effective coenzyme forms of B12. More recently, there has been growing doubt that the supply of only one of these forms is sufficient (5). Since the other bioactive B12 form, adenosylcobalamin, is produced through a totally different metabolic process and fulfils completely different biological functions, a supply of both active forms is likely the best option. This is even more probable given the fact that adenosylcobalamin is contained in many natural foods. For people who wish to obtain a vitamin supply that is as natural as possible, a combination of methylcobalamin, hydroxocobalamin and adenosylcobalamin is consequently the ideal choice. In this way, both coenzyme forms are obtained as well as the naturally-occurring hydroxocobalamin, which is a natural precursor of the coenzyme forms and is very well stored in the body. When is Methylcobalamin not the Right Choice? In high-dose initial therapy, methylcobalamin is not the ideal ingredient. High-dose methylcobalain can lead to overmethylation for people with pre-existing methylation disorder because the body can no longer control the production of methylcobalamin in this way. The best option here is the natural precursor, hydroxocobalamin. Firstly, it demonstrates a better storability; secondly, it allows the body to control the production of the active form itself. Can Methylcobalamin lead to Mercury Poisoning? For a number of years, a warning has circulated the internet that methylcobalamin can methylate mercury present in the body (e.g. from dental fillings) and thus produce highly toxic methyl mercury. The origin of this theory has not been clarified; there are neither studies nor sound scientific evidence for it. Most researchers consider it highly unlikely that such a reaction takes place. Kelly G. The co-enzyme forms of vitamin B12: Toward an understanding of their therapeutic potential. Alt Med Rev. 1997;2(6):459-471.